Sarah Ruhl is a playwright with a whimsical but charming bent. 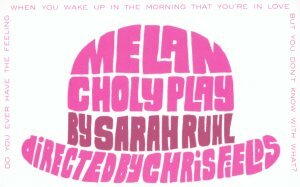 Her bittersweet comedy, MELANCHOLY PLAY, produced recently in a West Coast premiere by Echo Theater Company, was centered around Tilly, a daffy but delicious girl from the midwest whose melancholic nature, which she discusses openly and cheerfully, proves irresistible to both men and women alike. If this sounds contradictory, it is consciously that: Ruhl delights in the unlikely, in turning reality upside down and having fun with the resulting mess. Tilly was played winsomely by Polly Noonan, who brought looks, charm and elan to a role which required her to carry much of the play on her shoulders. Karl Wiedergott's Lorenzo, an outrageous caricature of an Italian psychiatrist, seemed like an escapee from a Moliere play but still managed to make his desire for Tilly palpable. Kristina Lear and Marilyn Dodds Frank were cast as a lesbian couple (a hairdresser and a nurse, respectively) who also go gaga over Tilly, as did Rob Helms as Frank, a bombastic dressmaker.